Nihon Sumo Kyokai - The Japan Sumo Association, which is the governing body for sumo. It determines the rankings of the wrestlers, the order of bouts, the referees and judges, all rules and regulations, including punishment, such as expulsion of a wrestler. Rikishi - a sumo wrestler registered with the Sumo Kyokai; literally a "gentleman of strength"
Sumo is a world of its own in Japan, with its own history (of over 2,000 years), culture, rituals, rules and regulations, personalities, and system of values. In its most basic form and at its lowest common denominator, sumo is a bout fought between two sumo wrestlers, one of whom emerges as the winner and the other the loser, of that bout. Wrestlers will be assigned bouts against other wrestlers in their own division without regard for the size, weight, or rank of either wrestler. However, wrestlers will not fight wrestlers from the same "heya" to which they belong as a living group, somewhat like being a member of a team. The only time when a wrestler will fight against a wrestler from his own stable is when, on the last day of a championship series, two wrestlers from the same heya have an equivalent best record of wins and losses, and these two wrestlers must fight in a playoff bout to determine the winner. There are about 800 sumo wrestlers in total, with about 40 in the makuuchi division. To see a sumo bout, the first thing one notices about the wrestlers is their immense size. As an example, Musashimaru, who is actually from Hawaii but has become a Japanese citizen, stands 191 cm (6 ft 3.5 inches) tall, and weighs 196 kg (432 lbs.). Musashimaru is the newest rikishi to attain the top rank of yokozuna, or grand champion. They may look fat, but they are incredibly strong, agile, athletic, and quick. 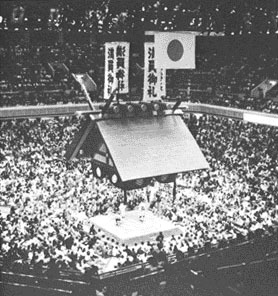 Six tournaments are held each calendar year, referred to as "basho" and delineated usually by the season of the basho, such as natsu, aki, or haru basho. Tournaments are held in different cities throughout Japan, with the three being in Tokyo, and others in Osaka, Nagoya, and Fukuoka. Each tournament is 15 days long, with each rikishi fighting once a day. The best winning record is 15 wins, 0 losses, then 14 -1, 13 -2, and so on. The order of bouts and opponents are determined each day by the Sumo Kyokai, with the contenders for the tournament title being paired against each other closer to the end of the tournament. After the last bout on the 15th day, rikishi with the best identical winning record will meet in a playoff bout to determine the tournament winner. If no playoff is needed, then the rikishi with the best record is the tournament winner. Yokozuna - Grand Champion, and once attaining this rank, a rikishi can no longer be demoted. He either will retire at this rank, or be expelled. Rikishi holding ranks other than Yokozuna can face demotion or promotion, depending upon their records of wins - losses, usually of the most recent tournament. To date, there have been 63 yokozunas; at least since records have been kept. Maegashira - Main Rank, and within this rank, there are sub-ranks of Maegashira 1, Maegashira 2, etc. up to Maegashira 15. Higashi - East, and Nishi - West. In a basho, rikishi are also divided into East and West sides, with the East side containing the rikishi of similar rank with the better recent records. These are arbitrary divisions, and have no particular meaning. Depending on who a rikishi is matched against on that day, he may enter the arena from the East or West side. The rikishi of the more senior rank will enter from his own East or West side, and the lower ranked rikishi from the other side. A new rikishi will start in the juryo division, and fight in bouts against other wrestlers in the juryo division. With winning records, he will be promoted into the makuuchi division, and then be ranked according to the ranking shown on the left, with the top rank being yokozuna. Rikishi receive monthly salaries from the Kyokai depending upon their ranks. Currently, yokozunas receive yen 2,300,000 per month (about US$19,000), and new rikishis in the juryo division receive a yen 720,000 (US$5,800) per month salary. Top ranked rikishi of course have many other sources of income, such as from sponsorship, advertising, and just outright gifts and donations. Companies may also offer a gift for an individual bout with the winner getting whatever amount is donated by the company. The winner of a basho will receive a money prize from the Kyokai of about yen 6 million (US$48,000). In the late 1950's, there were four active yokozunas in most tournaments, and that was a wealth of yokozunas. In the mid-1970's, a tournament might have 2 or at most 3 yokozunas. 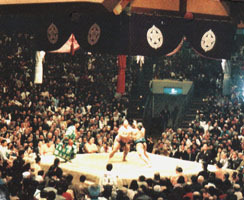 A bout in progress at the Kokugikan, and on the right, Ozeki Takanonami holding the Emperor's Cup for capturing the Yusho for the New Year's Basho, 1996, with a 14 -1 record, and beating his stable mate, Yokozuna Takanohana, in a playoff bout (a kettei-sen) on the last day of the basho.